Duty Free Bits n Pieces …. So I managed to pick up a few 'essentials' as I departed London for Sydney last week. Ok, there was actually nothing essential about what I bought, but I was about to embark on 24 hours of hellish torture so I needed a little something-something. 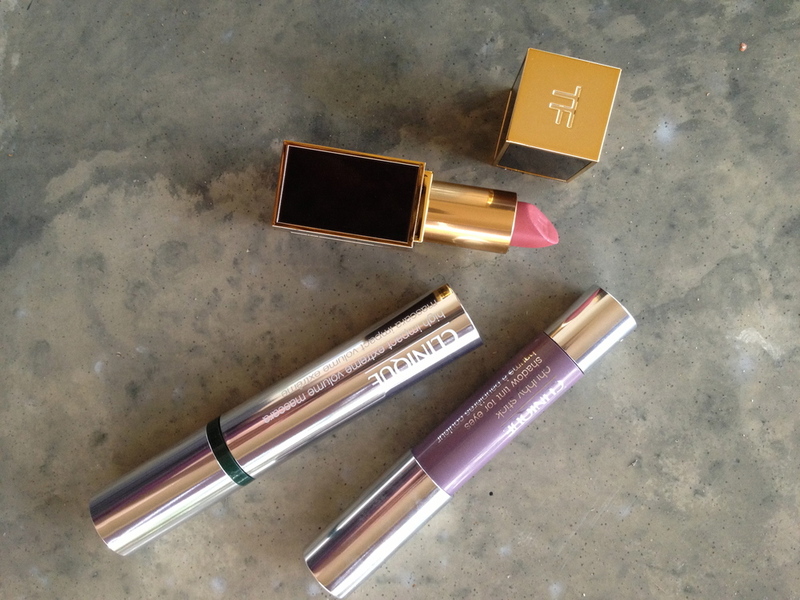 Tom Ford Lipstick in 'Indian Rose' - oh mother, this is good. It is as close to my beloved MAC Cosmo lipstick as I can find except the price is substantially steeper and the packaging is more luxe. It is a gorgeous rose shade like my lips only better and I love it in all it's beautifully packaged glory. The duty-free price of this was £30.60. Tom Ford cosmetics are sold in David Jones in Australia. Unfortunately they don't list prices on their website so i'm unable to link it for you. Clinique Chubby Stick for Eyes in Lavish Lilac - purple is definitely the new brown for me and I would encourage any green-eyed girls to try it if you haven't already. Purple tones really bring out the green in your eyes, and as weird as this sounds, many of the ones I have discovered have a brown undertone so they just work. It is very sheer so perfect on its own for daytime, and for a night look I ramp it up a little by adding some deeper purple powder shadow in the crease. The duty-free price of this was £14.15 and you can find this product here in Australia for $35.00. I also repurchased the Clinique High Impact Extreme Volume Mascara which I tried earlier this year. What sets this mascara apart from the others for me is it's incredibly fine applicator which makes coating each and every lash ultra-easy. The duty-free price of this was £14.15 and you can find this product here in Australia for $38.00. I've gone cold turkey on the makeup purchasing front while i'm in Sydney. Even an obsessive like me can't justify the crazy prices over here.